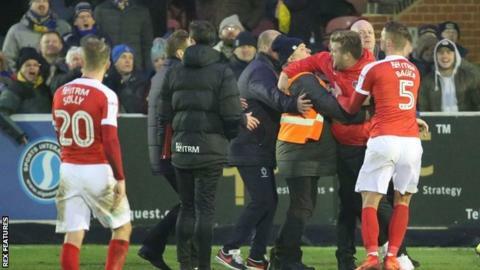 Charlton boss Karl Robinson says he was left disgusted after being confronted by a member of AFC Wimbledon's staff at the end of Saturday's 1-1 draw. Robinson, 36, had to be restrained after the incident which happened as the teams left the pitch. "He knows what he said to me," Robinson told Charlton's website. Robinson was manager of MK Dons, the club who resulted from Wimbledon FC's relocation from South London in September 2003, between 2010 and 2016. Tom Elliott scored a late equaliser before being sent off as AFC Wimbledon denied Charlton victory in an ill-tempered League One derby at the Cherry Red Records Stadium. "We get stick, it's part of the game, but when an employee of the other club says something like that, it shows the class of the person," added Robinson. "Certain aspects of it were disgusting and shouldn't be part of any industry. "In no walk of life should what was said be said. "It was always going to be hostile with the fans. It's part and parcel of the game." However he did pay tribute to other members of Wimbledon's staff and added: "To be fair, their staff and everyone else in the building has been brilliant since then. Credit to them and I have got a lot of respect for the way they conducted themselves." AFC Wimbledon boss Neal Ardley said that the club had been let down by a member of staff. "No matter what tensions there are in the game nobody should take it upon themselves to abuse people and take the law into their own hands. It's wrong," he told BBC Radio London. "Hopefully the club will do the right thing and deal with it in the right way." Charlton are 13th in the table, three points and one place above AFC Wimbledon.